Do not install or use the software until you have read and accepted all of the license terms. Permission to use the software is conditional upon your agreeing to the license terms. Installation or use of the software by you will be deemed to be acceptance of the license terms. Acceptance will bind you to the license terms in a legally enforceable contract with cragl - vfx tools. 1. GRANT OF LICENSE. cragl hereby grants you a limited, non-exclusive license to use the Software on one (1) computer at a time upon the terms and conditions set forth in this Agreement. cragl reserves all rights in and to the Software not otherwise granted in this Agreement. 2. RESTRICTIONS ON USE. You may not: (a) distribute, share, sublicense, lend, lease or otherwise make the Software available to any third party (on the Internet, an information network or tangible media, by broadcast or in any other manner), (b) modify, adapt, create derivative works from or translate any part of the Software, (c) reverse engineer, decompile or disassemble the Software or otherwise attempt to obtain its source code, (d) remove or alter any copyright, trademark or other proprietary notice contained in the software, or (e) use the software in any manner not set forth in this Agreement or in the software documentation. 3. USE OF CONTENT. You may not use the software for any purpose that: (a) infringes the copyright, trademark, patent, trade secret, right of publicity or any other right of a third party, (b) is or may be libelous, defamatory or slanderous, or (c) any other use that is illegal in nature. documentation are protected and must not be copied in any form without permission. 5. ASSIGNMENT. You may not assign the Software to any third party. 6. TERMINATION. Your right to use the Software will automatically terminate if you fail to comply with any provision of this Agreement. If this Agreement is terminated you must: (a) cease all use of the Software, (b) destroy the original and all copies of the Software, and (c) permanently delete all copies of the Software from the computer on which it has been installed. We may additionally at any time terminate your license to use the Software at our sole discretion. 7. DISCLAIMER OF WARRANTIES. Except for the limited warranty provided above, the software is provided as is. to the full extent permitted by applicable local law, cragl and the third party providers disclaim all other warranties, representations and conditions, express or implied, including, but not limited to, the implied warranties, representations and conditions of merchantability, fitness for a particular purpose and non-infringement. No oral or written information or advice given by cragl or an cragl authorized representative shall create a warranty. Without limitation of the foregoing, cragl and the third party providers do not warrant that: (a) the software will be error-free, (b) your use of the software will be uninterrupted or error-free, (c) the software will meet your requirements, or (d) the software will operate with the hardware or software configuration you choose. 8. LIMITATIONS ON LIABILITY. In no event will cragl affiliates or the third party providers liability to you or any third party exceed the price paid by you for the software. In no event shall cragl be liable to you or any third party for any special, punitive, incidental, indirect or consequential damages of any kind, or any damages whatsoever, including, without limitation, those resulting from loss of use, data or profits, whether or not we have been advised of the possibility of such damages, and on any theory of liability, arising out of or in connection with the use of the software. Further, cragl shall not be liable in any way for third party goods and services offered through this site or through third party websites linked to from this site. You are solely responsible for making backup copies of any and all of your content. cragl shall not be liable for any loss of or damage to your content. cragl may not function as advertised on your computer, for technical or other reasons. 9. EXCLUSION OF REMEDIES. Without limiting any of the disclaimers or limitations set forth in paragraphs above, in no event will cragl or the third party providers be liable to you or anyone else for any indirect, special, incidental, punitive or consequential damages of any kind arising out of your use or inability to use the software (including, without limitation, loss of profits, revenue, use of software or any associated hardware or software, data or goodwill), even if such parties have been advised of the possibility of such damages. 10. YOUR SPECIFIC RIGHTS. Some jurisdictions do not allow the exclusion of damages or limitations of liability, so the above exclusions or limitations may not apply to you. Your specific rights may vary from jurisdiction to jurisdiction. 11. EXPORT RESTRICTIONS. You agree not to export or re-export, or allow the export or re-export of the Software in violation of any such law, restriction or regulation, including, without limitation, export or re-export to Cuba, Iran, Iraq, Libya, North Korea, Sudan, Syria or any other country subject to applicable U.S. trade embargoes, or to any party on the U.S. Export Administration Table of Denial Orders or the U.S. Department of Treasury List of Specially Designated Nationals and Blocked Persons, or to any prohibited destination in any of the Country Groups specified in the then current Supplement No. 1 to Part 740 or the Commerce Control List specified in the then current Supplement No. 1 to Part 738 of the U.S. Export Administration Regulations (or any successor supplement or regulations). 12. UPDATES. cragl may from time to time make available to you updates for the Software, subject to the terms and conditions of this Agreement, or cragl may make conditional release of such upgrades to you upon your acceptance of another EULA or other execution of a separate agreement. If you should elect to install updates, your use of such updates will be subject to the applicable license and the terms and conditions of this Agreement. 13. SUPPORT. cragl is not under any obligation to provide any support under this Agreement, including upgrades or future versions of the Software or related products. Nonetheless, You should bring any concerns or problems You have to our attention via the support ticket system in your personal cragl backend or via [email protected] We want to make sure our users have a very positive experience with our Software, and we will use commercially reasonable efforts to address concerns that we believe, in our discretion, will improve the user experience. 15. CHANGES We may occasionally change these Terms, so we encourage you to review the Terms periodically. 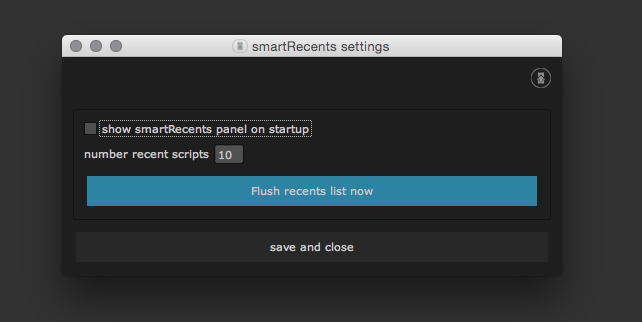 smartRecents is a script selector for NUKE. Keep track of your latest work and open nuke scripts directly from the smartRecents window. Additionally you can drag and drop a nuke script into your nodegraph. smartRecents lets you also reveal your nuke scripts in your explorer. Don't waste any time searching nuke scripts manually in your explorer. All your recent work is immediately accessible. 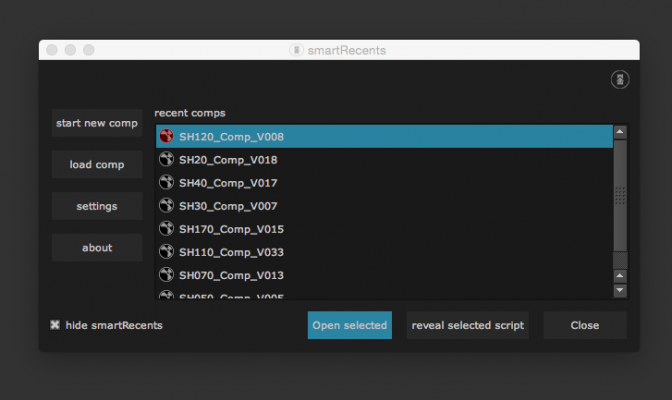 smartRecents offers a window to quickly access your latest nuke scripts. You can also drag and drop a nuke script into your nodegraph as well as revealing a script directly in your explorer. In the settings you can decide how many scripts you want to see in the smartRecents window and if you like to have the smartRecents window pop up whenever you launch NUKE or if you like to see it just when you need it. On how many machines can I use my purchased license? If you buy one license you can use it on one machine for commercial use plus on a personal computer/laptop for personal use. If you buy more than one license then you can use all of your purchased licenses on your machines for commercial use. A simple to do list that runs as a dockable panel in After Effects. When running Adobe After Effects under OSX, if the application becomes unresponsive, this application attempts to force a crash recovery that automatically saves a copy of your project. A tool that lets you know which part of your picture is too bright or too dark by pointing the bad pixels directly on your footage. Similar to the way zebra-stripping works on digital cameras. Find and apply plugins, effects, presets, scripts, extensions, menu commands and expressions with lightning speed! Run scripts, menu commands and apply expressions, from a searchable list or custom toolbars. Open script interfaces from anywhere in pre-docked panels. Forces After Effects to Auto-Save. smartMessage is an instant messenger for Nuke and Maya. Connect to locals and digital artists from all over the world. You can share text, node setups, cameras, animated geometry, urls, images, files, etc. Speed up your communication methods and enhance the collaboration among artists. smartLink provides node linking and an advanced node navigation system for Nuke. It lets you create representation nodes of all your nodes and favorite any node so you can easily navigate inside your node graph. In addition, smartLink offers a custom backdrop manager to keep your node graph neat and clean. smartCommand is a window that bundles all commands from all menus, submenus and custom menus into one central location and offers search functionality. There is no need for browsing menus anymore. Simply search for your commands and execute them. It lets you create custom lists to store all your favorite commands, assign hotkeys on the fly and execute custom python scriptlets. smartScripter provides functionality to quickly store, retrieve and execute python code, tcl code and Nuke node snippets. These can be stored as commands inside smartScripter and are shareable among artists. As smartScripter lets you quickly jump between different scripts, it can speed up your daily work, even if you are just working on your own. smartLook offers multiple features to enhance look development inside Nuke. It offers the snapshot browser to take snapshots of your work, flag and comment snapshots and work collaboratively on look versions for your comps. Furthermore, it lets you save, edit, import and export looks for each node as well as import and export toolsets. smartCollect is a multi threaded batch archiver for Nuke. It collects all your used sources (not only the read nodes) and makes archiving your shots super quick and simple. smartCollect creates detailed job log reports and is customizable to your needs. It can be run directly inside of Nuke or as a standalone application.